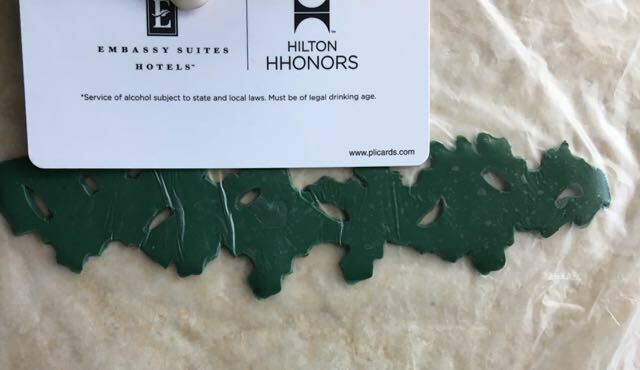 Out of ideas for holiday ornaments and decor? Return to this page for regular updates. I will be adding festive projects made from clay, glass, beads and more to this page until December 24, 2017. How many fun projects will you make this season? Earrings measure 2.50" from top of bead cap to crystal tips. 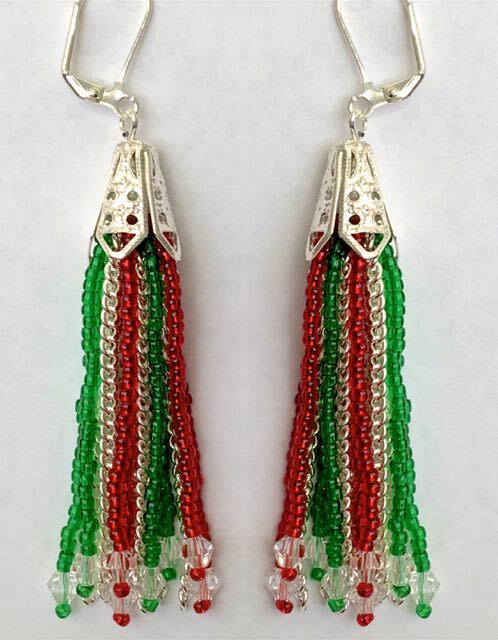 Red and green crystals dangle against strands of delicate silver chain to carry you through the holiday season in these festive earrings. Suspended from embossed silver bead caps, the crystals and silver chain sway together with every movement. 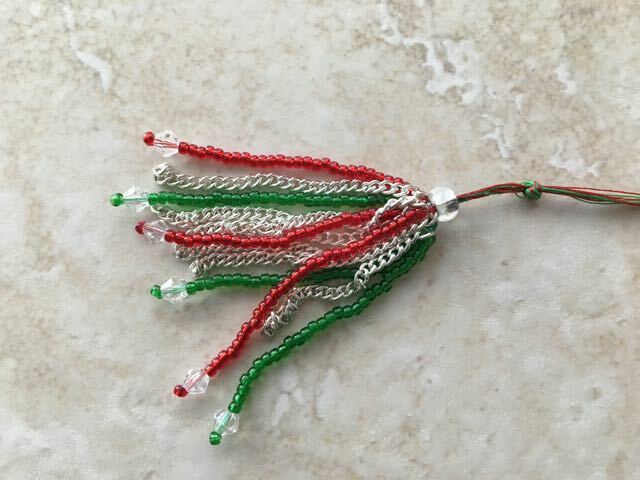 Red and Green glass seed beads are strung on colored thread in a super simple to create project. Seven steps are all that's required to complete these pretty earrings for your next holiday party. step 1 - Thread a beading needle with 12" of red thread. Slip 28 red seed beads onto the thread. Add a clear bicone bead and one more seed bead. Insert the needle back into the bicone and move up through all 28 beads. step 2 - Cut chain into eight 2.50" lengths. Bring one of the threads through through the first link on a chain section. step 3 - Tie the two threads together to form three knots. 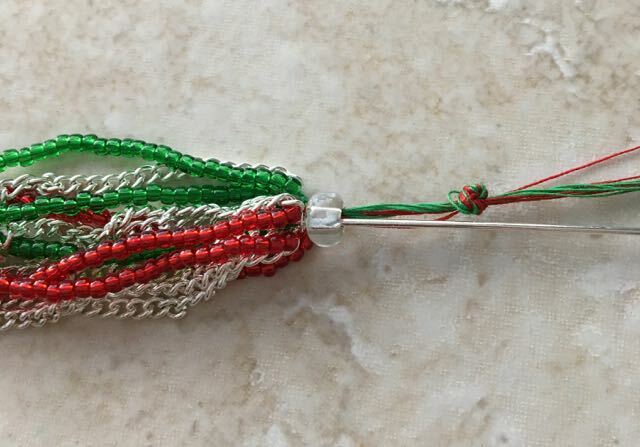 step 4 - Create a total of four red beaded strands and four green. Use green thread for the green beads. Group all the threads together and slip them into a 10mm bead with a large hole. Tie the threads into one knot. Smear adhesive above the beads and chain. 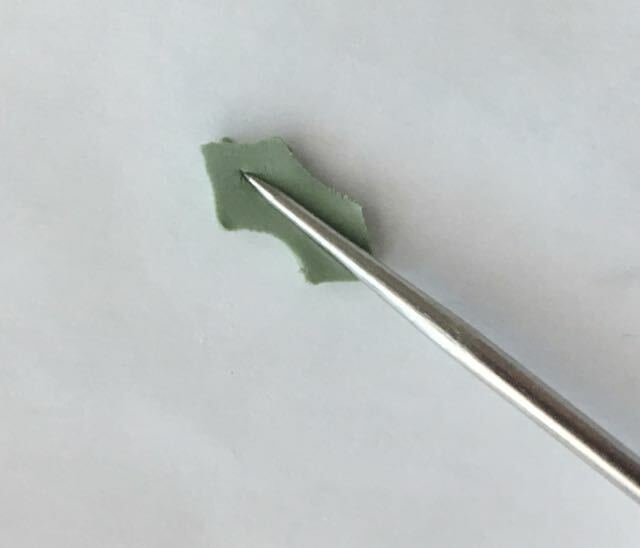 Slide the large bead until it is flush with the grouping and covering the adhesive. step 5 - Slip a nail head wire into the bead. Allow the glue to set. step 6 - Insert the wire into the center of the bead cap. Pull it up so the top of the chain and beads are up inside the cap as far as it will go. Create a loop in the wire. Connect it to a earring wire. 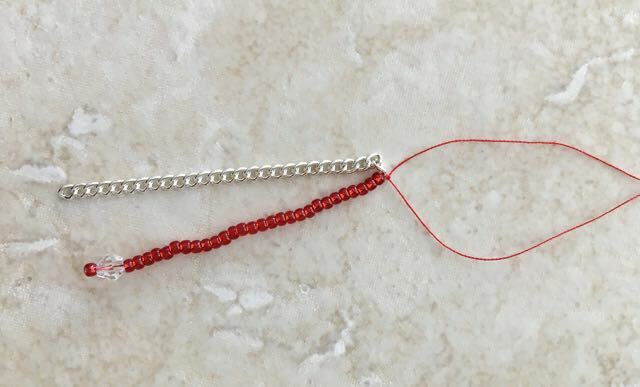 step 7 - Use jewelry wire cutters to remove links in the chains so they match the length of the bead strands. Fine silver chain - 40"
sled measures 2" x 5.50"
What could be more fun than a bright, red sled at Christmas? 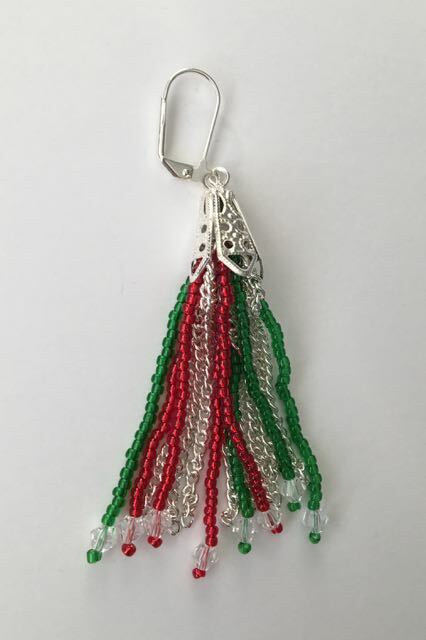 This one comes with bells to jangle with every movement, shiny silver runners, and a pretty silver and white cord for dragging the sled back up the hill... or hanging on a Christmas tree branch! 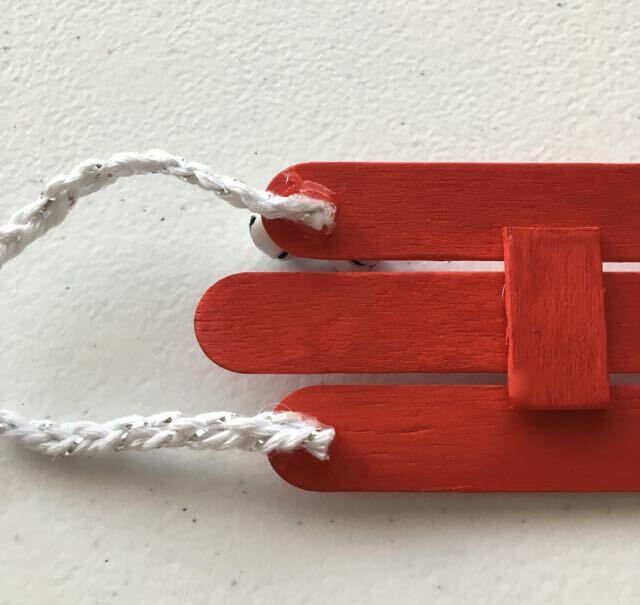 Simple craft sticks form the wooden sled. Hot glue holds everything together. Silhouette metal stippling sheets make the perfect runners. The sheets are cut with scissors and easily shaped. The edges can be sharp so handle with care. I folded the metal strips so the long outside edges of the runners are smooth. step 1 - Cut two one-inch pieces from a craft stick. These "connectors" will hold the three sled craft sticks together. 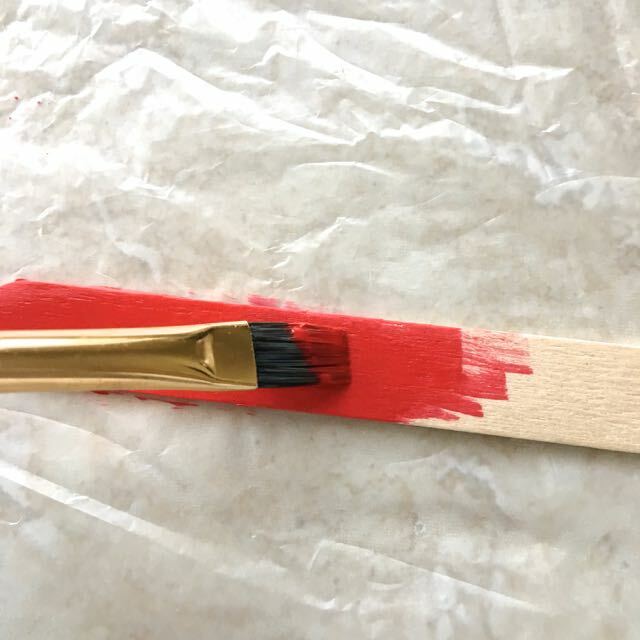 step 2 - Paint the connectors and three craft sticks with red paint on all sides. step 3 - Tape the three red craft sticks to the work surface. Allow 1/16" between them and move the center stick out about .50". Hot glue a connector to the sticks. step 4 - Glue the second connector .75" from the first. step 6 - Insert wire into the bells to control them while gluing them to the two outer craft sticks. Remove the wire after gluing. step 7 - Glue the cord ends to the underside of the sticks. step 8 - With a marker, draw a line 3/8" from the edge of the metal sheet. Draw another line at .75". 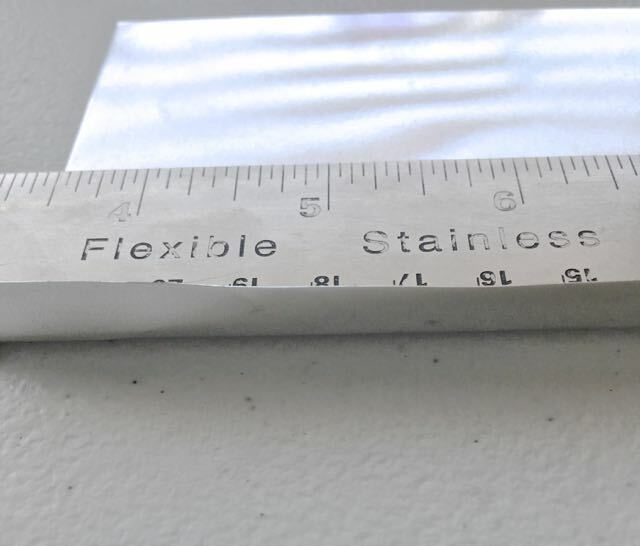 step 9 - Place a sharp edge ruler on the 3/8" line. 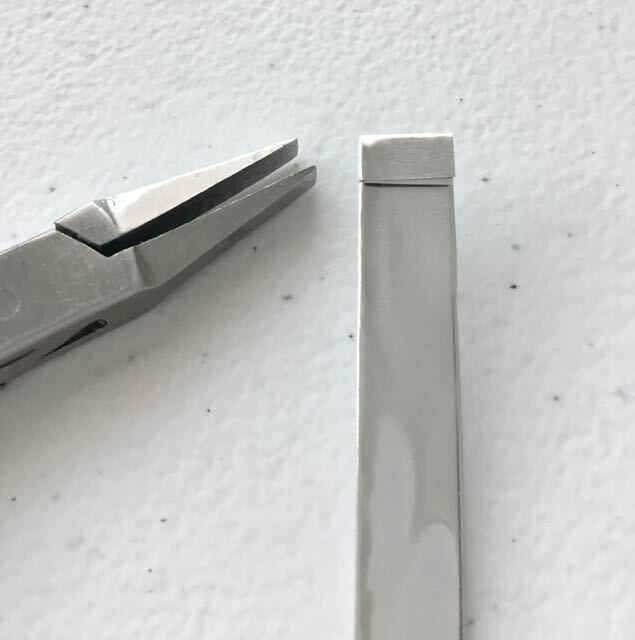 Fold the metal edge to the .75" line. step 10 - Place a soft cloth over the fold and press down on it with the ruler edge to create a sharp crease without leaving scratches. Cut along the raw edge to create the first runner. step 13 - Hot glue the curled piece to the center of the runner. Create a second runner following steps 10 - 13. Hot glue the raised curls on the runners to the wrong side of the outer sticks with the sticks centered on the runners. step 11 - With flat nosed pliers, create a small fold on both short ends of the runner. Smooth one runner end over a Sharpie or other round object to form a curl. Do the same for a slightly upturned end on the other edge. step 12 - Cut two strips of metal to measure 4.5" x .50". Curl the ends around a Sharpie. step 14 - Cut pieces from a holiday floral pick and glue them to the center of the sled. Brighten up your table with lights this holiday season and the "Jingle Bells" song ringing in your head. Lyrics from the popular song are printed on each side of the base. For my foundation, I used the bottom of a one pint Trader Joe's Half & Half dairy carton cut to 1.25" high. The 3" square carton size allows the battery pack for the lights just enough room to sit under the finished project. 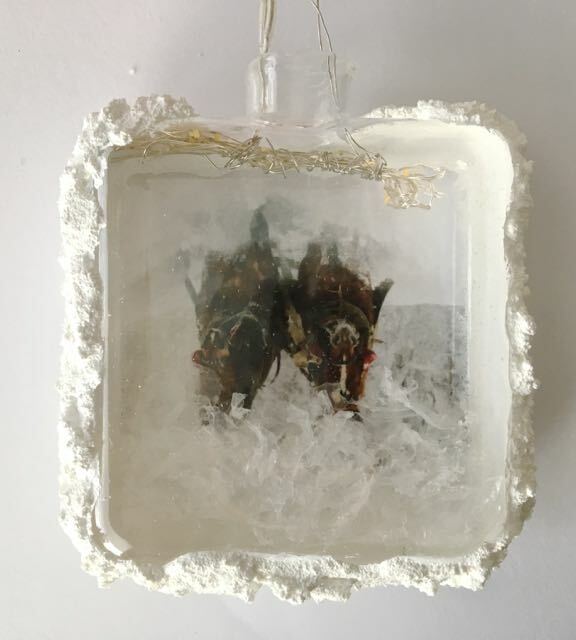 Fluffy Frosty Snow inside the glass ornament camouflages the micro light string at the bottom of the image. The lights are battery operated with the pack hidden under the base, making it easy to access the switch. Snow-Tex outside the project lends a realistic winter atmosphere. 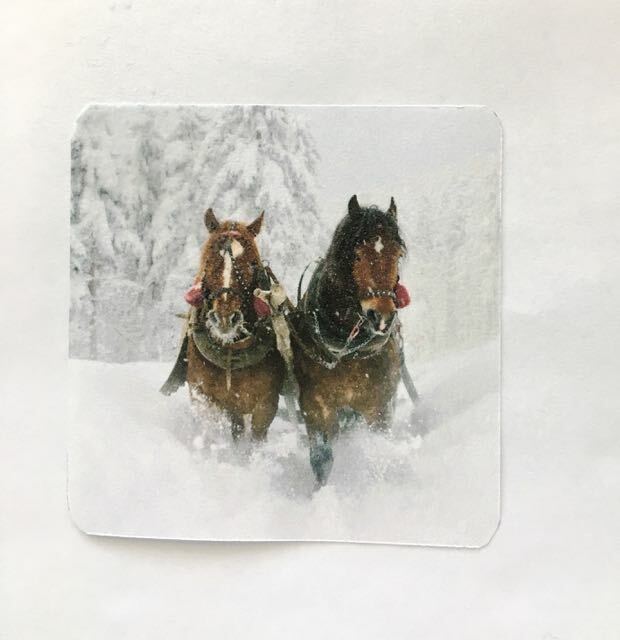 A personal family sledding photo would be ideal for this project. step 1 - Download the template page. On card stock, print out the three-phrase strip and the one-phrase strip along with the image frame. step 2 - After sizing your image to match the frame template, print it out on regular paper with an ink jet printer. 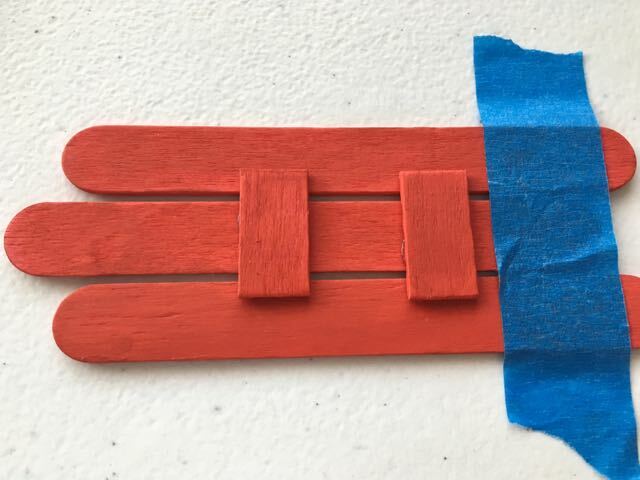 step 3 - Apply a light coat of spray adhesive to the right side of the image. step 4 - Center the glass ornament on the paper with the opening facing down. Press the paper to the glass. step 5 - Glue the short-phrase strip to the end of the long one with Elmer's Glue. When it dries, cut out the strip on the long lines. Fold on the short lines. step 6 - With Elmer's, glue the phrase strip around the carton with the bottom edge aligned with the carton edge. Secure it with clips until it dries. step 7 - With a craft knife, cut a round hole slightly larger than the opening at the bottom of the ornament. The finished ornament will rest in this hole. Make it a snug fit. 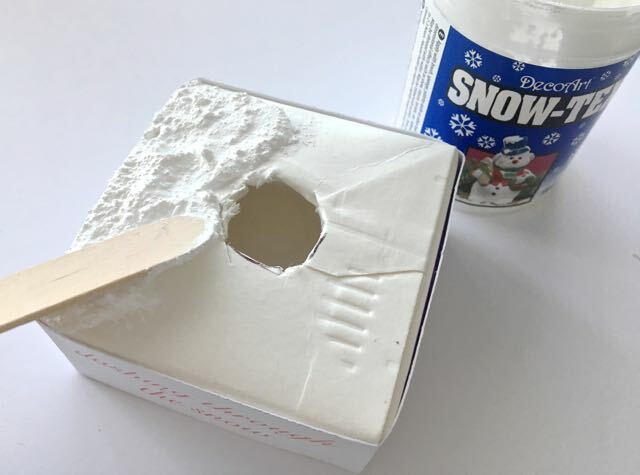 step 8 - Apply Snow-Tex to the flat surface of the base with a craft stick. step 9 - Apply Snow-Tex to the glass' top edge, two side edges, and backside on the paper. The product will not soak through the paper. The applications should be done one section at a time with the glass flat and level. Allow it to harden before working on another section. If Snow-Tex is applied to the entire glass and propped up to dry, it will slide off the glass. step 10 - Place batteries in the battery pack. Loop the light wire back and forth around your fingers so it measures no more than 3.50" long. Wrap 26 gauge wire three or four times around the left and right looped ends. Leave 4" long tails on the wires and snip away the rest. 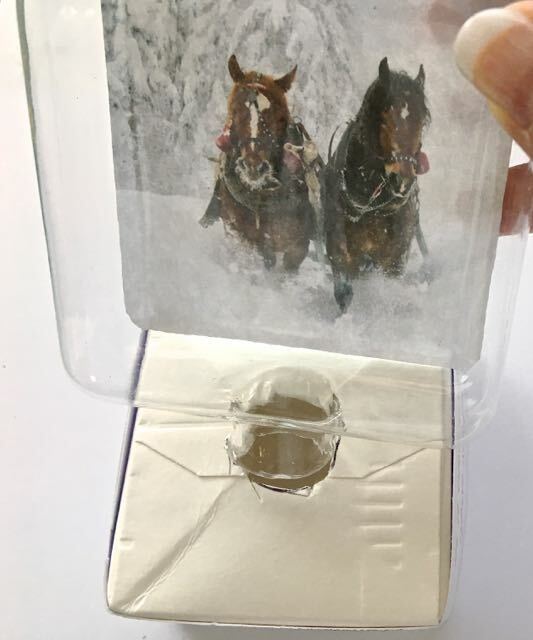 step 11 - Turn the hardened, snow-covered glass with the opening facing up. Fill it with about a one-inch layer of Frosty Snow distributed evenly inside the glass. 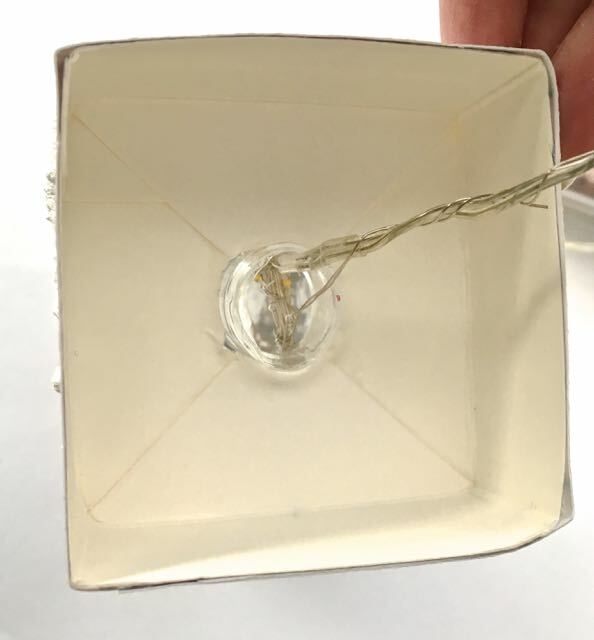 step 12 - Insert the light string vertically through the opening in the base. Stuff one end of the lights inside then the other. Don't let go of the wire tails. step 13 - Use the tails to pull the lights against the bottom of the glass. step 14 - Place the base over the glass opening. Tape the wires to the underside of the base. Cover the opening with tape to prevent Frosty Snow from falling out. step 15 - Turn on the lights and place the base over the battery pack. Dairy carton or container - minimum 3" square x 1.25"
Beautiful holly strips highlighted with metallic colors come together to form an inexpensive and festive ornament. The clay strips are draped over a dollar store glass ball ornament for support while baking. The glass is tapped away from the baked clay leaving an empty sphere that's unique and colorful. This project can be can be cut with the Silhouette Curio machine, the Cameo 3, or manually with a craft knife. Directions for Silhouette users (SC) and craft knife users (CK) are included in this tutorial. Directions without initials apply to all crafters. Click on the "Silhouette Cut File" above to download the project for your Silhouette machine. Before you begin, condition all clay. step 1 - CK - Download and print out the templates on card stock. Cut out the images with a knife to create stencils. Use the stencils to cut one long and 4 short pieces from green clay. step 2 - SC - Download the cut files. Place freezer paper on the cutting mat shiny side up. Position the clay on the paper. With the deep cut blade's cap removed and the blade set to #10 blue, cut one long piece and 4 short pieces from the clay. Use Curio settings: 3 Platforms, thickness 20, speed 3, material - thick fabric or create a custom Clay Cut setting. Place the cut pieces on deli film and press up from the back to dislodge the clay. step 3 - Sandwich the clay between deli film. Place an acrylic roller on the film and lightly roll across the surface. Do not apply pressure. This will flatten raises edges but will not change the overall size or shape of the clay. step 4 - Using a plastic card pull across the clay to thin only the edges. step 5 - Remove the deli film. With a sculpting tool, create veins for the leaves. step 6 - With your finger, apply green Mica Powder to a few leaves. Continue adding Copper, Pearl, and Heirloom Gold powders. step 7 - Use a hole cutter to create the berries. Put each circle in the palm of your hand and use your index finger to roll it into a ball. step 8 - Apply a small amount of translucent liquid polymer to the clay. step 9 - Add a berry to the liquid then two more. Be sure each comes in contact with the liquid. Press down lightly on the berries. Pierce a tiny hole in the center of each with a toothpick. step 11 - Add two short strips evenly spaced on one half of the glass with the ends overlapping at the top. The bottom of the strip should come in contact with the long strip. step 12 - Add the remaining two strips to the opposite side of the glass. Press all the ends together at the bottom. step 13 - Lay the ornament in sand or other soft padding and support to avoid flattening the berries or leaves while baking. Bake the ornament in a 275 degree oven for 30 minutes. Allow it to cool completely. step 14 - Wrap the ornament in an old towel. With a small hammer lightly tap on the glass only, working around the ornament. The glass pieces will separate from the clay. Pieces will be very sharp. Carefully shake them out and discard them. step 15 - Thread a ribbon through holes in the top of the ornament. 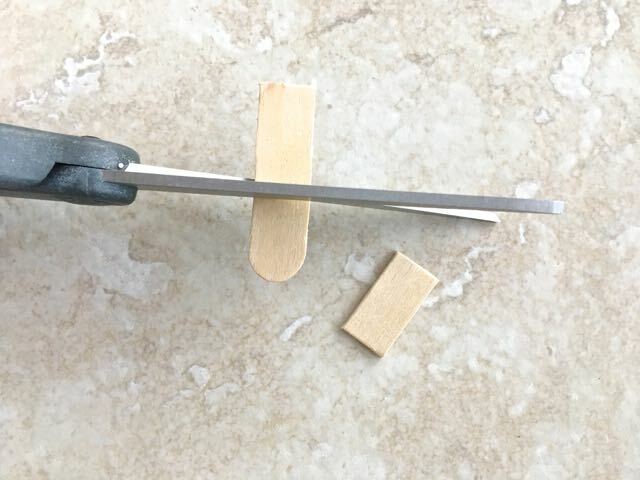 If it does not hang evenly, use a craft knife to lengthen a hole where necessary. Santa's Mailbox is overflowing with letters in this fun project. Holly frosted with mica powder, addressed envelopes, stamps with sketch pen designs and a striped mailbox flag are the special details that make this ornament whimsical and irresistible. All elements are made from clay and cut using the free template or cut files. This project can be cut with the Silhouette Curio machine, the Cameo 3, or manually with a craft knife and the suggested sketch pen. Directions for Silhouette users (SC) and craft knife users (CK) are included in this tutorial. Directions without initials apply to all crafters. Click on "Silhouette Cut File" above to download the project for your Silhouette machine. step 1 - CK - Print out the template page on regular paper. Use the template to cut the box bottom from red clay rolled on #3 setting of the conditioning machine. SC - Download the cut files. Set freezer paper on the machine's cutting mat with the shiny side up. Place a sheet of red clay rolled on #3 setting of the conditioning machine, on the mat. Cut the box bottom. step 2 - Gently create a fine impression on the template with a sculpting tool to mark the clay where the flaps for the mailbox lid and its back wall begin. Step 3 - Set the clay on an oven proof object with a sharp edge like a block of wood, with one clay flap draped over the edge to create a 90 degree angle. Bake at 275 degrees for 30 minutes and allow the clay to cool completely. step 4 - Cut white clay to match the body template. Also cut a toilet paper cardboard tube a bit smaller than the template. This will provide support inside the mailbox during baking. Optional - Use the template dots as a guide for cutting holes to thread a wire or ribbon hanger into the mailbox. step 5 - SC - After cutting the body template, change settings for sketching (see the bottom of this page). Sketch "North Pole" on the white clay with a black sketch pen. Shake the pen and wipe the tip often to get the best results. step 6 - SC - Change settings for cutting and cut the envelopes. Change to the sketch settings again and address the envelopes with the black sketch pen. step 7 - CK - Cut out the envelopes. Use the sketch pen to address the envelopes freehand to write "north Pole" on both sides of the body. Draw trees or other elements on the postage stamps with sketch pens. Step 8 - Apply translucent liquid polymer to the sides and the angled flap of the box bottom. Step 9 - Set the body face down on the deli film. Always cover sketched clay with deli film until baking to avoid smearing the ink. Place the box bottom on one short edge of the body. Step 10 - Position the cardboard tube then wrap the clay body over it, pressing the clay edges to the Liquid Polymer. Work around the curve of the red clay pressing it to seal the back wall of the mailbox to the body. Step 11 - Cut the flag from white clay. 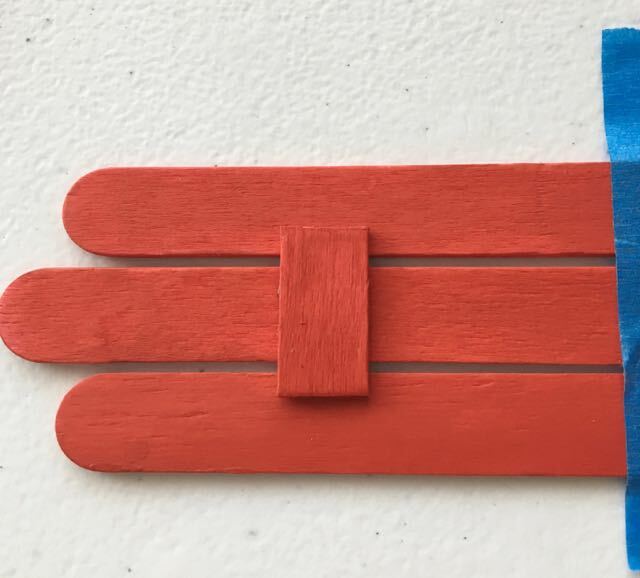 Create thin strips of red clay and place them diagonally on the clay post. Roll over them lightly with an acrylic roller to adhere the pieces. Step 12 - Place the envelopes on a tile for baking. Place Q-tips under one or two so all the envelopes are not completely flat. Step 13 - Use the template or cut files to cut several green holly leaves. There are two sizes and two shades of green. One is Green and the other is Green mixed with a little White. step 14 - Press the center of the leaves with a fine tool to create the center vien. Step 15 - Roll bits of Red clay in your palm to form the berries. The berries will be uniform in size if you cut the clay bits with a small hole cutter before rolling them. step 16 - Remove the deli film and place the mailbox on parchment paper supported by a ceramic tile. Position the mailbox on its side. Arrange the holly and berries as desired applying Liquid Polymer to the pieces to bond them. Apply Liquid Polymer to the wrong side of the flag and press it to the side of the mailbox. Stuff the center of the mailbox with tissues if necessary to hold it's shape. step 17 - Use a Q-tip to apply Pearl Mica Powder to the holly. step 18 - Bake the envelopes and the mailbox at 275 degrees for 30minutes. step 19 - Hot glue the envelopes into the mailbox at various angles. If necessary, remove ragged surfaces from sketched clay surfaces with an angled craft knife after baking and cooling. The edges will scrape off easily. Ragged edges result from too much pressure from the sketch pen. To avoid this, try using one less platform or rolling the clay thinner with an acrylic roller before sketching. To eliminate having to key in these settings, save them to your menu list with a dedicated "Cut Clay" title. To eliminate having to key in these settings, save them to your menu list with a dedicated "Sketch Clay" title. This project can also be cut on the Silhouette Cameo 3.